Pierate - Pie Reviews: How Do The Pies Square Up? Square pie have been visited by the Pierateers before on the very special occasion of our 100th pie review. (You might think that was a long time ago as we approach 250 pie reviews but it was infact just last year!) But in case you aren't familiar with this old London pie favourite let me remind you. A fast food style pie establishment, the pies are already cooked and waiting in a warm counter for the eager customers to eat within minutes of entering the restaurant. 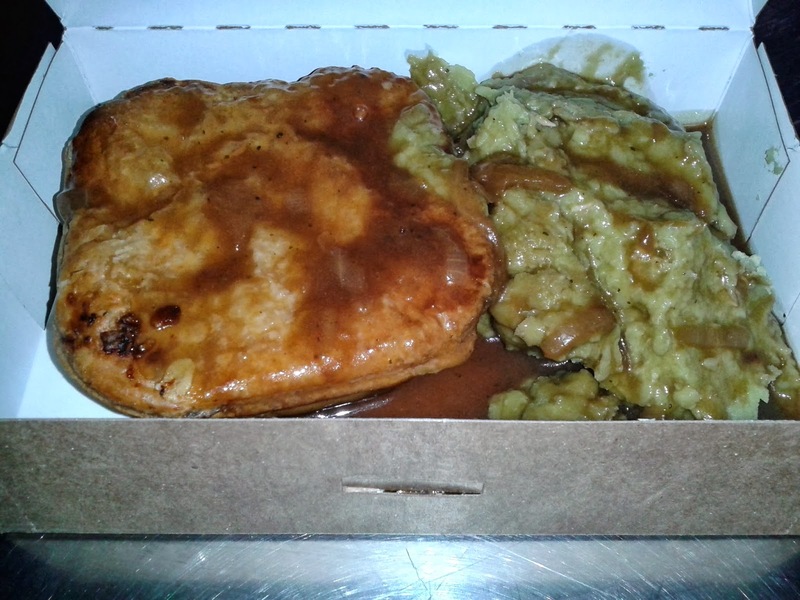 You have a choice of veg and potato options to make your pie a meal if you desire. This type of fast pie is fairly unique, Battersea Pie Station and Urban Pie are the only others I can think of who are doing the same thing. The benefits from this format are clear. It offers a pie restaurant experience a bit cheaper than your average pub and the pies tend to be fairly gourmet with an interesting variety of flavours. 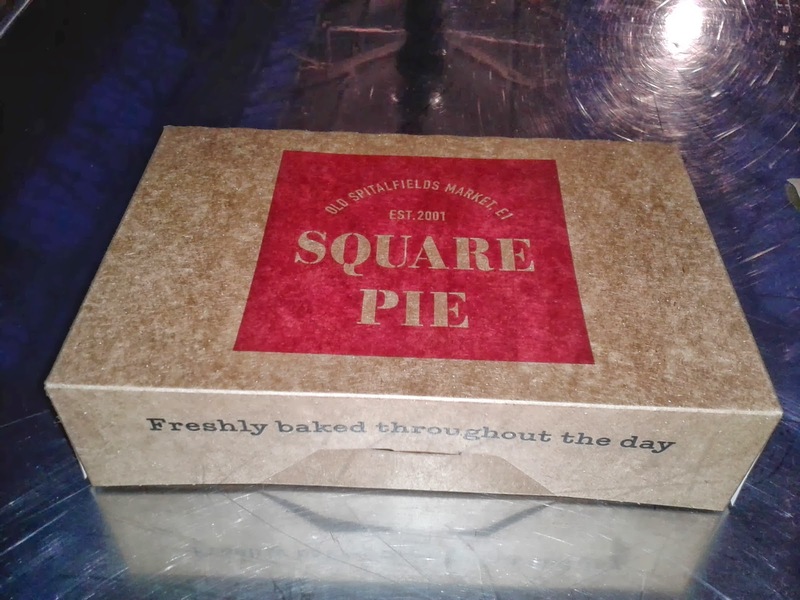 However, Square Pie seem to be the original, having established their first outlet in Old Spitalfields Market back in 2001. Despite having visited a number of times before the fast pie experience keeps drawing me back. It is just a very convenient way to get a pie. A recent trip saw me grab a Chicken, Leek and Wiltshire Ham Pie with peas and gravy for £6 from Old Spitalfields Market. 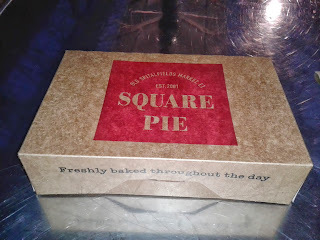 This was one of their more expensive pies so I hoped to taste the best Square Pie offer. For comparison a similar pie meal at Urban Pie would cost £4.95 and £7.00 in Battersea Pie Station (to eat in). So we are looking at a fairly competitive price (as usual remembering we are in expensive London). But of course I had high expectations given that this was a restaurant where the pies are the main attraction. They earn their crust making pies every day and claim to be a cut above mass produced pies. I am pleased to say they didn’t disappoint. I think this was the best square pie I have had so far. In the photo I have pulled out some of the filling so you can see there were big chunks of chicken and plenty of ham too. Pieces of leek were easy to find and they added plenty of flavour. This pastry was perfect; buttery and soft. 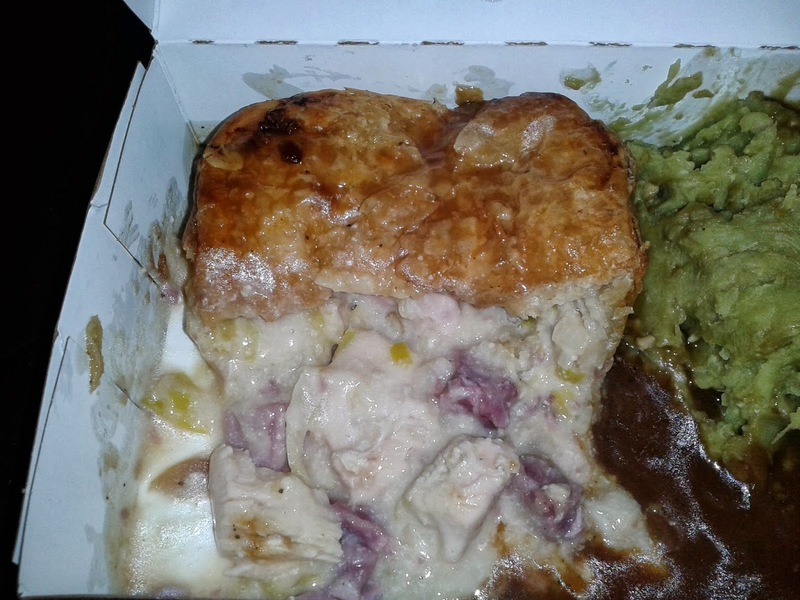 There was plenty of thick gravy inside the pie with a real meaty taste. It is actually difficult to say that there was anything wrong with this pie at all, it did everything right. So why did it not get a full score for a pie which left me very full? I think this was mainly down to the chicken, the texture of which didn’t quite do it for me. Also the pastry perhaps slips down too easily, it is quite gooey and I think my ultimate pie has a bit of crunch. However, these are minor criticisms and overall this pie squares up very well to the competition. See where this pie ended up amongst our Best London Pies and our overall Pie Rankings.